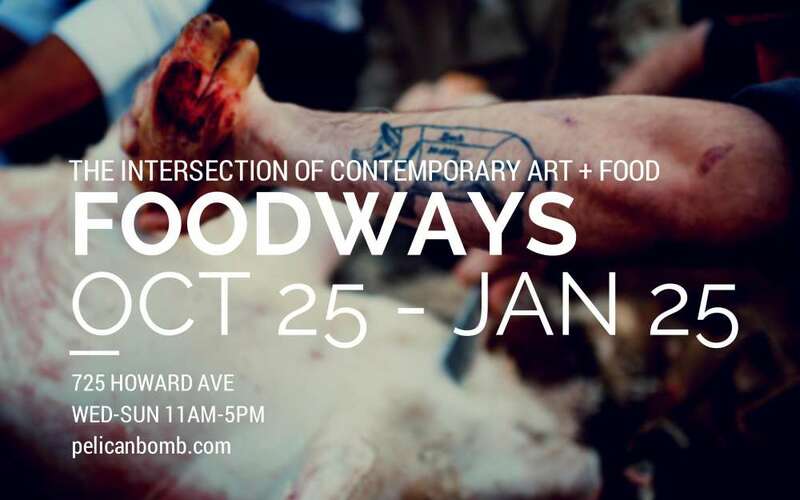 Pelican Bomb opens "Foodways" exhibition on October 25, 2014 at 725 Howard Avenue in New Orleans. Pelican Bomb is pleased to present "Foodways," an exhibition of contemporary artist practices that uses food as a lens to examine the preservation culture. On view at 725 Howard Avenue, it is housed in the future home of the New Orleans Culinary and Hospitality Institute. The exhibition coincides with Prospect.3, as part of the international art biennial’s P3+ satellite program. About Pelican Bomb: Pelican Bomb is a contemporary arts nonprofit based in New Orleans since 2011. Dedicated to making the city a viable and sustainable place for artists to live and work, Pelican Bomb builds infrastructure to support artist communities through its main programs: an online publication of contemporary art, a community supported art program, a roving exhibitions program, and a critic-in-residence program. As part of its roving exhibitions program, Pelican Bomb activates empty, underutilized, or otherwise transitional spaces through unique thematic exhibitions that explore the intersection of New Orleans social history and contemporary art. About NOCHI: New Orleans Culinary and Hospitality Institute (NOCHI) is a nonprofit organization that was established in 2013 for the purpose of marrying world-class culinary and hospitality facilities, content, and programming with New Orleans’ indisputable standing as a world-class culinary and hospitality city. Beyond providing exceptional training, education, and R&D in the fields of culinary arts and hospitality, NOCHI aspires to elevate New Orleans to a position of thought leadership across multiple disciplines that intersect with food/hospitality for the purpose of creating rewarding careers and improving quality of life for its local citizens and the larger global community. For all press inquiries, contact Amanda Brinkman at 504.252.0136 or amanda@pelicanbomb.com.